The book is the story of the Baxter family- Alice, David and their four children. Alice is approaching her 60th birthday and 40th wedding anniversary and decides, uncharacteristically, to hold a party to celebrate the occasions and have her family together. As Alice prepares for the party we see that everyone in the family is dealing with problems of their own and they may not be in the mood to party! David has recently retired and become apathetic; however he has a sudden change in behaviour. At first Alice is pleased as this seems to stop him objecting to her party as she had anticipated. Will she feel the same when she finds out what has been happening? My favourite character was their daughter in law, Annie who gave up a career in magazines to move to the country with her husband and focus on raising their children, however she is bored at home and would rather be back at work. I also liked the daughter Sadie, who works as a farmhand despite a university degree, and her children have to cope with her poor choices. Other issues brought up in the book include step-families, unplanned pregnancy and stay at home fathers. The characters are easy to relate to and the ending is satisfying. Overall I enjoyed this book and will look for others by this author. 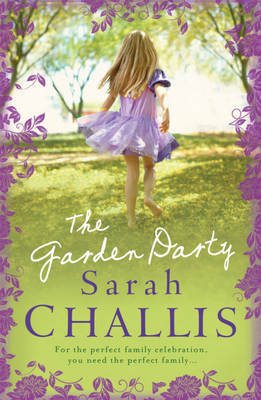 This entry was posted in Fiction, New Arrivals, Recommended Reading and tagged Author, book review, books, Parramatta City Library, reading, Sarah Challis, The garden party, Writer by admin. Bookmark the permalink.